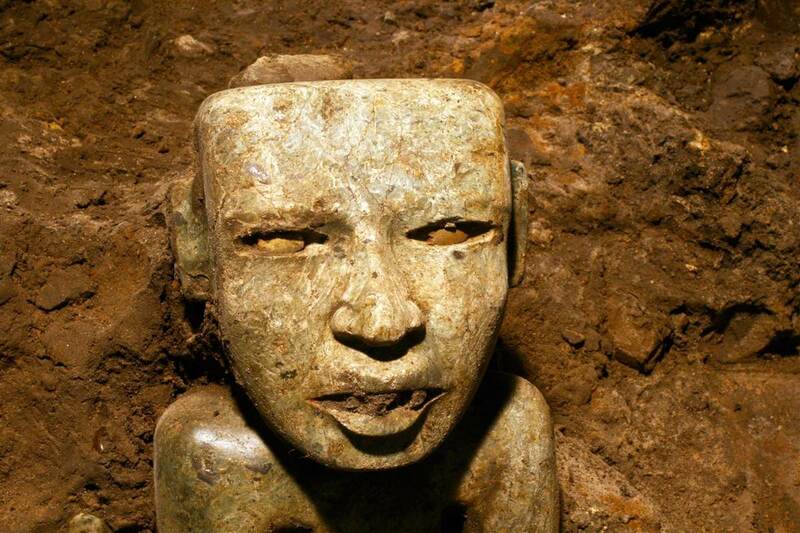 This photo released by Mexico’s National Institute of Anthropology and History shows a sculpture unearthed at the Teotihuacan archaeological site in Mexico. MEXICO CITY — A sacred tunnel discovered in the ancient city of Teotihuacan is filled with thousands of ritual objects and may lead to royal tombs, the lead Mexican archaeologist on the project said Wednesday. The entrance to the 1,800-year-old tunnel was first discovered in 2003, and its contents came to light thanks to excavations by remote-control robots and then human researchers, archaeologist Sergio Gomez told reporters. The site is located about 30 miles (50 kilometers) northeast of Mexico City. The ruins have long been shrouded in mystery because its inhabitants did not leave behind written records. An estimated 50,000 objects, 4,000 made of wood as well as scores of obsidian blades and arrowheads, provide clues into how the city’s priests and rulers conceived the underworld. Gomez, , who works for Mexico’s National Anthropology and History Institute, said he hoped to find a royal tomb at the end of the tunnel. “Due to the magnitude of the offerings that we’ve found, it can’t be in any other place,” he said. One of Mexico’s most-visited ancient sites, Teotihuacan is home to massive pyramids, temples and elite residences including many adorned with colorful murals. The city reached its peak between 100 B.C. and 650 B.C. with a population as large as 200,000, growing rich from a wide-ranging trade in obsidian that in pre-Columbian times was used to make knives and other weapons. Two of the sculptures unearthed by investigators at the Teotihuacan archeological site in Mexico. Mexican archaeologists have concluded a yearslong exploration of a tunnel sealed nearly 2,000 years ago at the ancient city of Teotihuacan and found 50,000 relics. A sculpture unearthed at the Teotihuacan archeological site in Mexico. The city reached its peak between 100 B.C. and 650 B.C. witha population as large as 200,000, growing rich from awide-ranging trade in obsidian that in pre-Colombian times wasused to make knives and other weapons. The ruins have long been shrouded in mystery because its inhabitants did not leave behind written records. ‘Due to the magnitude of the offerings that we’ve found, it can’t be in any other place,’ said Gomez, who works for Mexico’s national anthropology and history institute, referring to the possibility of finding royal tombs. The artifacts found inside the tunnel, located below the Temple of the Plumed Serpent, include finely carved stonesculptures, jewelry and shells. A stone sculpture (left) and a jar representing the god Tlaloc (God of the Rain), found at the Temple of the Feathered Serpent (Serpiente Emplumada) at the Teotihuacan complex in Mexico City. The items were discovered 103 metres from the entrance of the temple. ‘We’ve been able to confirm all of the hypotheses we’ve made from the beginning,’ he added, saying ongoing excavations could yield more major discoveries next year. Shells unearthed by investigators at the Teotihuacan archeological site in Mexico. The temple is best known for the towering Pyramids of the Moon and the Sun. The complex of pyramids, plazas, temples and avenues was once the center of a city of more than 100,000 inhabitants and may have been the largest and most influential city in pre-Hispanic North America at the time. But nearly 2,500 years after the city was founded – and about 2,100 years after the Teotihuacan culture began to flourish there – very little is known about the identity of its rulers. Sculptures unearthed at the Teotihuacan archeological site in Mexico. Mexican archaeologists have concluded a years long exploration of a tunnel sealed nearly 2,000 years ago. Vertical excavations begun in 2009 to reach the mouth of the tunnel suggest it was a ruler’s tomb, archaeologist Sergio Gomez said in 2010. Rich offerings were tossed into the tunnel at the moment it was closed up, including almost 50,000 objects of jade, stone, shell and pottery, including ceramic beakers of a kind never found before at the site. ‘I think the tunnel was the central element, the main element around which the rest of the ceremonial center was built,’ Gomez said. ‘There is a high possibility that in this place, in the central chamber, we can find the remains of those who ruled Teotihuacan,’ he added.